Clockwise from top left: a Pueblo Revival style house from the period of 1920 to 1950, characterized by earth-colored stucco; a house in the Transformed Sonoran style, popular from 1863 to 1912; a bungalow, popular from 1905 to 1930, broke away from historical precedents and emphasized simplicity of form; a Wrightian-Bay house in a style popular from around 1900 to 1920. 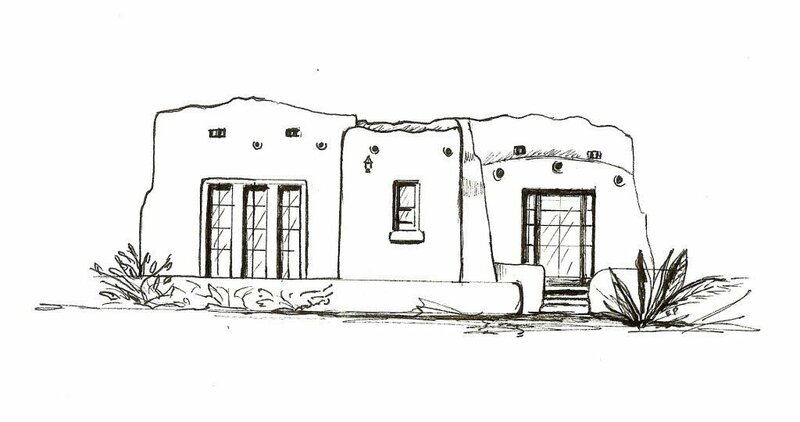 For a guide to Tucson’s historic neighborhoods, artist Erika Parrino sketched Sonoran row houses, Craftsman bungalows and Tudor Revival homes. It’s a diverse lineup, yes, but it’s all Tucson. 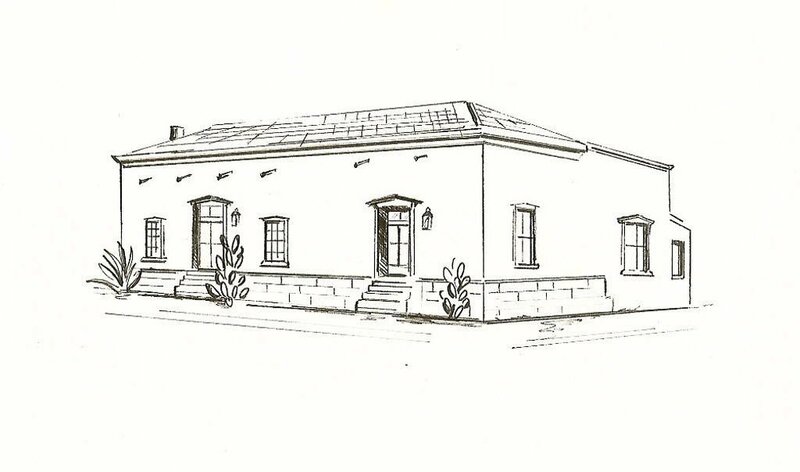 For the 2011 pamphlet “A Guide to Tucson’s Historic Neighborhoods,” Parrino used pen and ink to draw 23 architectural styles that line the streets of residential districts listed in the National Register of Historic Places. The Blenman-Elm Neighborhood Association organized the project, distributing 25,000 free copies of the guide, which won a historic preservation award from the Tucson Historic Preservation Foundation and the Tucson-Pima County Commission in 2012. Because the list of 28 neighborhoods now includes San Rafael Estates, the neighborhood association printed an additional 15,000 second-edition pamphlets with funding from Banner-University Medical Center and began distributing them this week. Tucsonans can pick up a guide at local spots such as Etherton Gallery, 135 S. Sixth Ave.; Antigone Books, 411 N. Fourth Ave.; or the Tucson Visitor Center, 110 S. Church Ave. The idea came to Glasston, a resident of Blenman-Elm, after she saw a similar guide in Phoenix. On her drive home, she wondered why Tucson didn’t have one. The idea gathered a following. Representatives for Tucson’s other historic neighborhoods — many of them in the downtown and university areas — pitched in, submitting blurbs about the significance of their community for the guide. R. Brooks Jeffery, director of the Drachman Institute in the University of Arizona’s College of Architecture, Planning and Landscape Architecture, wrote the introduction. “This type of guide to Tucson’s historic neighborhoods helps raise awareness of how those neighborhoods contribute to our community character and make us different from everywhere else,” said Jonathan Mabry, the historic preservation officer for the City of Tucson who worked with Blenman-Elm on the project. The neighborhoods included in the guide must meet the criteria of “age, significance and integrity” before they can become a nationally registered historic district, Mabry said. More than 50 percent of the properties within the neighborhood must also comply with certain criteria, he added. Not all old neighborhoods qualify. But those that do take pride in it. Sure, these historic neighborhoods provide visual appeal with their architectural flair, but there is more to them than that. "These kinds of things are nice because they tie you to the history and the people that came before," said Hannah Glasston, the editor of "A Guide to Tucson's Historic Neighborhoods." Here are 10 tidbits of Tucson lore hidden behind the architecture. 1. Pie Allen neighborhood gets its name from former mayor John Brackett Allen, who made an unsuccessful homestead claim on part of the district in the 1870s. He also had a penchant for selling dried-apple pies to soldiers in the area. 2. In the 1870s, Leopoldo Carrillo opened Carrillo Gardens in Barrio El Hoyo, which included a lake, ponds and animals. A nearby field hosted University of Arizona football games and the first demonstration of someone flying a plane in Tucson. The area became amusement park Elysian Grove. 3. Harold Bell Wright Estates is named after the American novelist who owned a home in the district in the 1920s. Street names were also inspired by characters in his novels. 4. When C.B. Richards began developing Winterhaven in 1949, he wanted to emulate a Midwestern neighborhood. The neighborhood's private water system makes the green lawns and non-native vegetation possible. Inspired by a light display in Beverly Hills, Richards originally wanted to give each street a Yuletide name for the annual Festival of Lights. 5. From the 1910s to 1930s residents in Menlo Park could take a dip in the Clearwater Swimming Pool — sometimes. The pool was on land owned by a family who occasionally drained it to irrigate their watermelon fields. 6. The U.S. Army's Camp Lowell moved from its original site near today's downtown to the current location of the Fort Lowell neighborhood in 1873 to prevent soldiers from carousing with the temptations offered in town. 7. In 1946, Samuel P. Goddard, a future Arizona governor, and his wife founded the Aldea Linda neighborhood. The Goddards also donated a lot for the Unitarian Universalist Church of Tucson, 4831 E. 22nd St.
8. Stephen Child designed one of Tucson's early subdivisions Colonia Solana in 1928, using natural aesthetics influenced by his association with landscape architect Frederick Law Olmsted. 9. Isabella Greenway opened the Arizona Inn in Blenman-Elm in 1930, not just to improve tourism in Tucson, but also to employ the disabled veterans who built the inn's furniture. 10. The development of San Rafael Estates began in 1954 after the Sisters of St. Joseph of Carondelet sold land to the Lusk Corporation. The neighborhood and street names honor Catholic saints. Get "A Guide to Tucson's Historic Neighborhoods"
Collages are inspired by the spirit of the desert.